Fat young doe, Oct. 25, Southwestern Missouri. 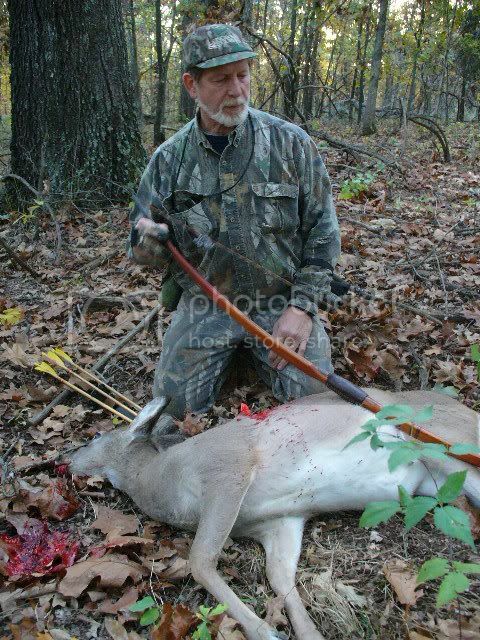 First deer with "Easy", Dean Torges Osage and hickory longbow, 64", 57# @ 27". Superceder arrows, 160g. Snuffers, total weight 620 g.
Good eating for sure! 10 yard shot, she barely made it out of sight. You might have just described a perfect hunt. Fat doe, 10 yards, short short trail at the end of Oct. so you aren't freezing or swattin' mosquitoes. Nice deer with a nice bow. Congrats!!! Just curious, what spine Supercedar are you shooting to get good arrow flight off your Torges? Nice shot.It sure is a good feeling when they go down in seeing distance. Craig, I'm pulling Easy to about 55# I think, and she bare-shafted with 60-65# shafts using 125g. field points on 28" shafts. My broadhead arrows with 160g. Snuffers are 65-70#. A little stiffer than I expected- it's a hard-shooting bow. I tried the broadheads on the 60-65# shafts, but it needed a little more spine. Finished arrow length is 28 1/4 bop. I found that my draw length (to the back) is a little shorter with this handle type. A thing of beauty right there. Congratulations sir.